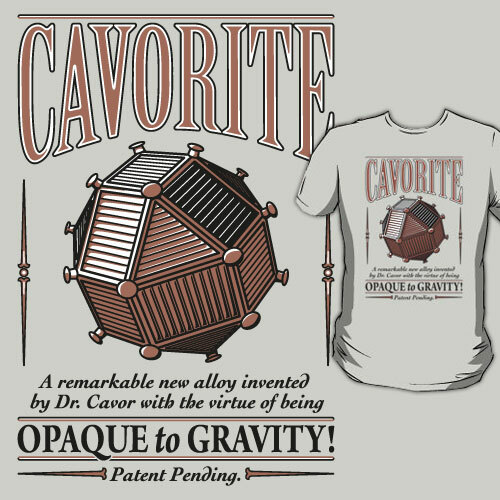 Cavorite is an alloy having the wholly remarkable property of being opaque to gravitation. This allows heavy weights to be placed on top and moved as if they were light as a feather. It can even be fashioned into a covering for a spherical capsule which could then be used as a way to travel beyond the Earth’s atmosphere, perhaps even to the moon! Based on Dr. Cavor’s fantastic invention. As described in ‘The First Men in the Moon’ by H.G. Wells. Also available on dark shirts, iPhone cases and stickers from RedBubble.